The building on the left is the thirteenth Century Poor Priests Hospital. 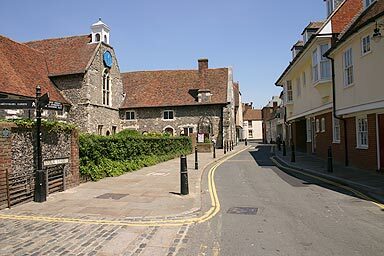 It has been turned into the Museum of Canterbury and houses a `time walk' through Canterbury life from the building of the Roman Town; the murder of Thomas Becket; the original steam locomotive used on George Stephenson's Canterbury and Whitstable railway; and up to Rupert Bear, whose creator, Mary Tourtell lived in Canterbury. I like the Anglo-Saxon portable sundial, perhaps the earliest watch. The museum has a copy, visit the Cathedral treasury to see the silver original. The building itself is worth a visit, the roof is a fantastic demonstration of craftsmanship in wood.